This versatile wall mounted wood drop leaf table provides ample work and display space inside and outside of your home. The perfect accent to your deck or balcony, the table lets you maximize space without cramping your style. All that's needed is a wall space, and instantly you have an extra shelf, tool bench or side table. 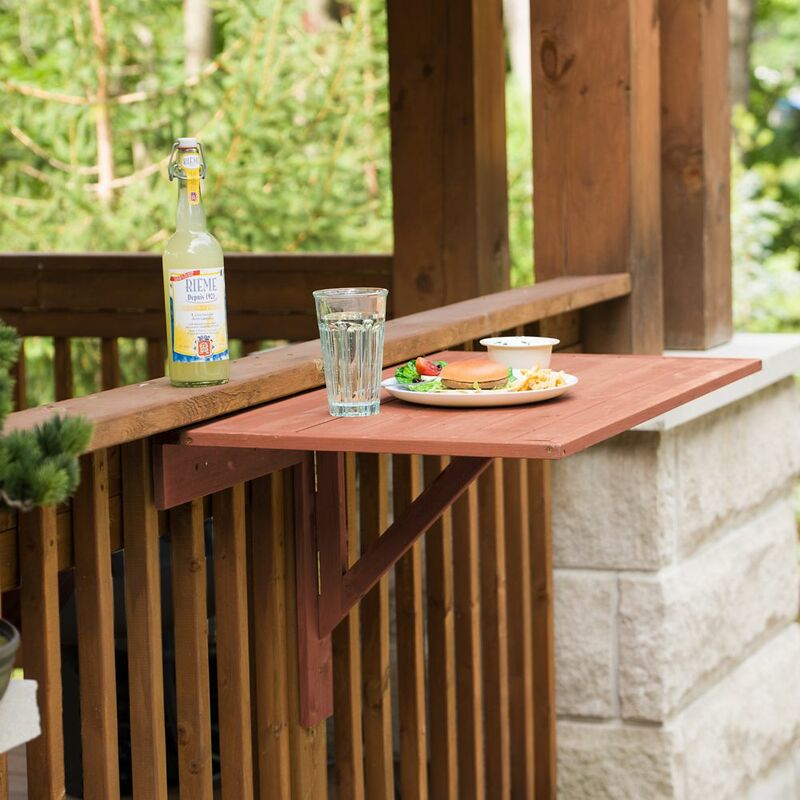 Wall Mounted Drop Leaf Patio Table This versatile wall mounted wood drop leaf table provides ample work and display space inside and outside of your home. The perfect accent to your deck or balcony, the table lets you maximize space without cramping your style. All that's needed is a wall space, and instantly you have an extra shelf, tool bench or side table. Wall Mounted Drop Leaf Patio Table is rated 3.0 out of 5 by 4. Rated 2 out of 5 by Home handyman from Poor workmanship and quality control. Bought this item over a month ago. The support arm and base that holds the table up came off on the first try when I received this item. There was non-existent glue and very puny screws that were barely holding them together. Not impressed. Used real carpenter's glue and proper screws to secure the pieces together. Only positive about my purchase was the on-time delivery which was local and not from overseas. Didn't return it because I was able to repair it to my specifications. Rated 3 out of 5 by Bartman from Fits the bill nicely After reconfiguring my garage to fit both a pick up truck and a smal suv, I lost some counter space. This table folds along the wall and extends to accommodate any small items or assist in little projects. It's definitely not sturdy enough to handle heavy jobs but performs nicely in little tinkerings. Rated 3 out of 5 by Frankh from It is perfect for my application. The product was easy to install and looks good even with a few minor finishing flaws. The table is definitely not heavy duty but the affordable price reflects that so it's not a huge complaint. It works as advertised but the support arm should have a locking feature, which I added myself so that the table doesn't drop accidentally. Rated 4 out of 5 by dansteve from Works I attached it to the wooden railing of my apartment deck. I placed my portable barbeque on it and have been using it for over a month with no problems. I plan to drill a hole down into the support and add a pin for extra security so the support cannot accidently be knocked out of place. I think this would be a good feature to add to this product. Can this table be attached to a metal balcony railing? The dimensions of this item are 36&quot; x 22&quot;. Can this table be mounted on a wooden patio railing?